He may be only 28, but the now-chosen candidate for Bengaluru South has handled the party's IT cell and campaigned for several party candidates during the state polls last year, reports Bibhu Ranjan Mishra. “OMG OMG!!! 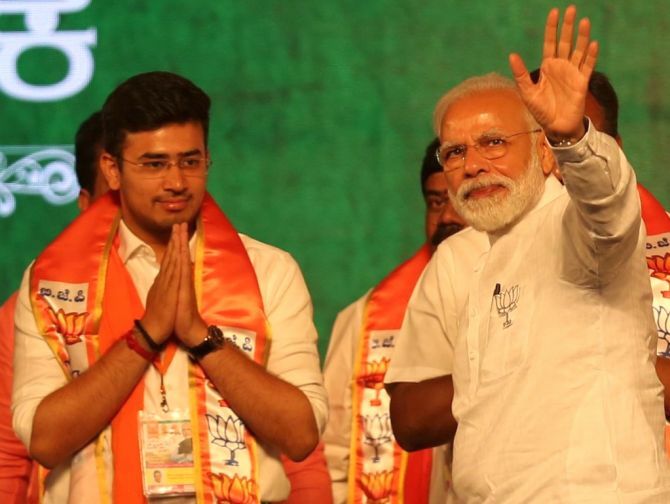 I can’t believe this” -- this was how 28-year-old Tejasvi Surya reacted after he was announced the Bharatiya Janata Party’s candidate for the prestigious Bengaluru South Lok Sabha constituency. This was certainly not the language of politicians but connected well with the younger population. But when in a subsequent television interview, the interviewer compared his reaction to that of a teenager getting ready for his first date, Surya’s reply was much more mature and statesmanlike. One wondered if Surya’s reaction was instantaneous or just a carefully crafted expression of a well thought out strategy. 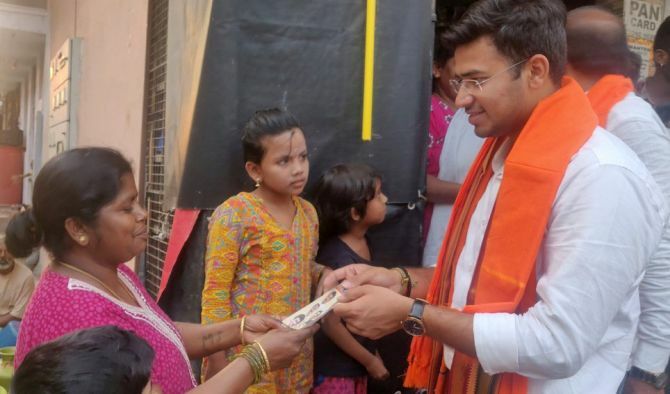 An active member of the Akhila Bharatiya Vidyarthi Parishad, the student wing of the Rashtriya Swayamsevak Sangh, and vice-president of the state Bharatiya Janata Yuva Morcha, Surya is no novice in the world of politics. He handled the BJP’s IT cell and campaigned for several party candidates during the state polls last year. 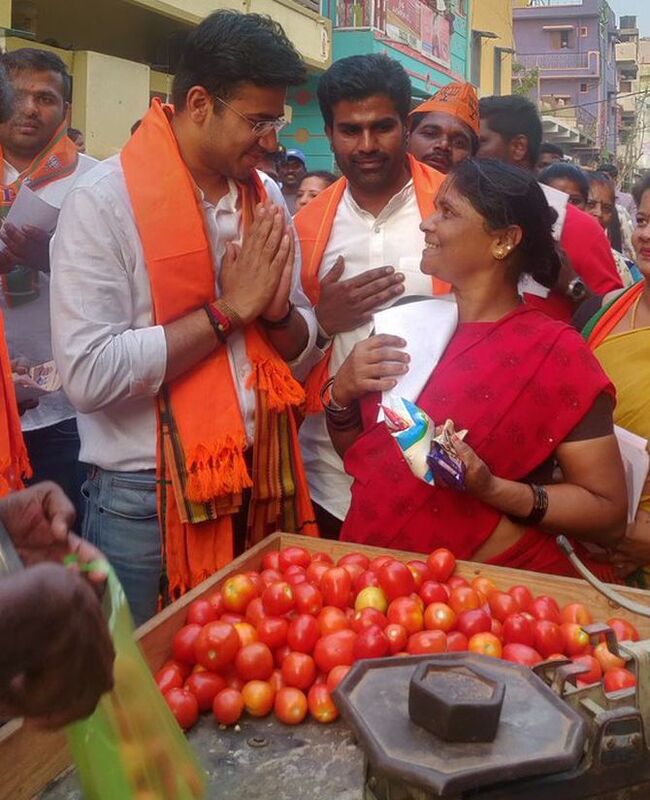 He is also the nephew of Ravi Subramanya, BJP MLA from Basavanagudi, which falls under the Bengaluru South Lok Sabha constituency. But some believe that what may have also have gone in his favour is the infighting within the Karnataka BJP, especially between state party President B S Yeddyurappa and the party’s National Joint General Secretary (Organisation) B L Santosh. A veteran RSS member, Santosh was said to be eyeing to fill the void created by the absence of the late Union minister Ananth Kumar. “Surya represents the young guard of the BJP in the state, and sooner or later, the old guard has to make way,” said Harish Bijoor, a noted Bangalorean and leading brand and marketing expert. But as the young leader takes the plunge into electoral politics, he may have to face several hurdles, from both within and outside the party. A day after he was announced the BJP nominee, his name was dragged into several controversies, including his so-called ‘misogynist’ comments on Twitter and several other radical posts. The most damaging one, however, was the allegation made by a start-up founder that she suffered physical and mental harassment at the hands of the young politician for five years before she decided to end the relationship. And in a matter of hours, someone who was seen as one of the promising faces of Indian politics was projected a villain -- the state Congress unit dubbed him “another M J Akbar in the making”. Surya is also expected to face several hurdles from within the party, prominently from Tejaswini Ananth Kumar, the wife of Ananth Kumar, and several other top state BJP leaders who are said to be close to her. Bengaluru South has always been considered as the traditional stronghold of the BJP. This is the parliamentary constituency from where Ananth Kumar had won elections for six consecutive terms. In fact, the chances of the saffron party retaining the seat were even seen more imminent after the demise of Kumar. So Tejaswini, an active social worker who stood behind her husband in many of his electoral battles, was seen as the obvious choice as the BJP’s candidate for the seat. She had already started her campaign until it was cut short by the rather unexpected decision. On the other hand, Surya is said to be groomed by Kumar himself. Political analysts while agreeing that in the given situation, theoretically, Tejaswini had a fair chance of winning the seat, they feel that she probably miscalculated the political move of the party’s central leadership. During the 2018 state election, the BJP had given a clear message that the party was not in favour of hereditary politics when Yeddypurappa ’s younger son B Y Vijayendra was denied the ticket from the Varuna assembly constituency, even though he had already launched a vigorous campaign before the list was out. Besides, some experts say that the common belief that sympathy votes will come to the rescue of kin of a deceased family member has not always been proven right. At least, in a place like Bengaluru, which boasts a huge cosmopolitan and floating population, this has been proven wrong in the recent past when the Congress’s Sowmya Reddy beat the BJP’s B N Prahlad, who was seeking votes in the Jayanagar assembly by-poll after the death of his brother and sitting MLA Vijaykumar.